Mike had occasion to share this story, and to discuss his father’s lifelong commitment to training and mentorship, when he and his wife, Sara Moss, visited MIT in July. They came to meet a group of undergraduate students from outside MIT who were spending the summer in the Department of Biology thanks to the Bernard S. and Sophie G. Gould Fund. Established by Mike in memory of his parents, the fund supported seven students participating in the 2016 MIT Summer Research Program in Biology (MSRP­-Bio). Over a group lunch, hosted by Biology Department Head Alan Grossman, Mike became the latest Gould family member to field questions from inquisitive students, and to ask some of his own. Foremost among the topics that Mike was asked about were his parents and why he had chosen this particular way in which to honor them. 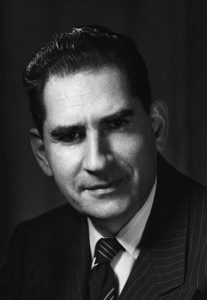 With obvious pride and great humility, Mike explained that his father first arrived at MIT as an undergraduate student, earning his degree in 1932. After going on to complete his Ph.D. at the University of London, Bernie returned to Cambridge and spent nearly 40 years on the MIT faculty. As a researcher, he specialized in the biochemistry of wound healing, tissue regeneration, and the role of vitamins in these processes. As a member of the department, he served as friend and counselor to generations of students and many faculty colleagues, even after his retirement in 1977. In 1987, the year of Bernie’s death, the Biology Department shared its collective sadness in its Report to the President and noted how deeply he would be missed. Mike’s mother Sophie was also an MIT alumna, studying public health and earning a master’s degree at a time when there were few female graduate students at the Institute. Sophie actually met Bernie on MIT’s campus, shortly after graduating from Hunter College, and the two were married in 1938. Sophie was the daughter of Louis Ginzberg, one of the great American rabbinical scholars of the 20th century, and Adele Ginzberg, known as a role model and inspiration to rabbinical students and women leaders. It is no wonder then that Sophie shared her husband’s commitment to supporting and counseling young students. In addition to raising their three sons, Sophie worked for a small foundation that provided resources to young Jewish women who wanted to attend college. 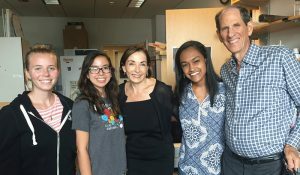 Mike Gould (right) and Sara Moss (center) touring the laboratory of Professor Bob Horvitz with MSRP-Bio students (left to right) Kiera Sapp, Cristina Torres Cabán, and Sheena Vasquez. After learning about MSRP­-Bio, Mike and Sara knew it was the right opportunity to honor Bernie and Sophie. Established in 2003, the program has two goals: to provide an intensive research experience for undergraduate students from institutions with limited research opportunities and to increase the pipeline of under­represented minority students, first generation college students, and students from economically disadvantaged backgrounds entering science Ph.D. or M.D.­Ph.D. programs. Students typically enroll in the 10­week program the summer after their sophomore or junior year in college and must have a grade point average of at least 3.5, provide three letters of recommendation, and articulate a genuine interest in research. To date, more than 250 students have participated in MSRP­Bio and over 80% of them have since enrolled in Ph.D. or M.D.­Ph.D. programs across the country, including more than three dozen who have studied at MIT in various departments. Mentorship is one of the most important factors in the success of the summer program and in the success of the participants’ pursuit of a career in research. Each student is matched with a faculty mentor and carries out supervised research in the mentor’s laboratory, working closely in that laboratory with at least one graduate student or postdoc and being paired with another graduate student in a neighboring laboratory for additional support. Combined, this group provides advice, guidance, and perspective on careers in science and on the life of a scientist ­in ­training. It was this mentorship component that convinced Mike to establish the Bernard S. and Sophie G. Gould Fund. All of the students at the July lunch received support from the fund, and Mike and Sara asked each of them to talk about their background and what brought them to MIT. One by one they shared their gratitude and cited their reasons – including the high caliber of research on campus, the opportunity for mentoring from faculty and graduate students, and being part of a driven and innovative community – but each also expressed surprise at having been admitted. This prompted Alan to give a quick lesson on imposter syndrome and to assure them that they were all there for a reason. Mike followed by pointing out that, while they had indeed all earned it, it was now up to them to capitalize on this opportunity. With that reminder, and his generous gift, Mike continues his family’s long tradition of providing guidance and support to talented life sciences students at MIT. 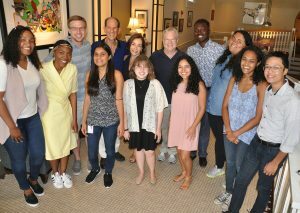 Past and current Gould Fellows meet with Mike Gould and his wife Sara Moss.